That quote has recently become one of my favorites because it resonates so much with me. If you are like me, then there is rarely a time when you can be found without headphones in your ears or music being played. Music is such an incredible thing because, regardless of how you are feeling, there is a song out there for you to listen to. If you are happy, if you are sad, grieving, angry, lost, confused, tired, or any other emotion you can think of, there is music out there to accompany that feeling. And if you are like me, you seek out that music to ease your mind, drive you, calm you down, or even lull you to sleep. Music is beautiful regardless of what you listen to – music is an amazing thing. Even people who are deaf have reported being able to feel the vibrations of music, which while not the same as hearing, it still enables them to experience it, albeit in their own ways. I wanted to write about music because, to me, music is a constant companion – it’s always there for me, no matter how pissed off or alone I may feel, I always have music to listen to. Music can remind me of who I am. Music can bring me back to feelings that I experienced in the past – it can allow me to remember those who have passed on. Think about the music you’ve listened to throughout life, has the genre of music that you primarily listened to changed? Or has it stayed the same? I’ve found that as I’ve grown, the music that I’ve listened to has changed and mellowed out as my outlook on life has changed. 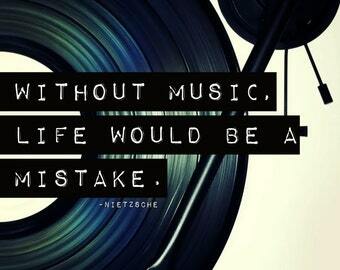 Not because the music that I listened to in the past was bad or that I no longer liked it, but simply because the music that most suited me here and now changed. A friend of mine said something that I really agreed with yesterday. “When asked what your favorite song is – if you can definitively narrow it down to one song. I feel that you don’t really get music.” As elitist as that may sound, I think there is a lot of truth in it. Music isn’t a static entity, it is a growing, changing creature with heart and if you find only one song that you really truly love more than all the others, I don’t think you understand that. Music can only be as beautiful as you will allow it to be to you, and so if you want to limit yourself to the wonders and beauties of music, then I have to say that I hope that one day you will change your mind, because that doesn’t sound like living to me. There is one last point that I would like to make before I end this. Music is so wondrous that it even has medical applications. From the ER room, where it can ease the patient or the surgeon, to – and this is the most amazing to me – reminding us who we were again when our minds have begun to go. People have begun giving patients with Alzheimer’s, and general memory loss, the music they listened to when they were younger and the results have been incredible to say the very least. What an incredibly positive video! I had occasion to take a small class of mixed disability children last year and resorted to music to communicate something, anything. The effects there were amazing too in that each of the children – of widely differing capabilities – got up to dance and ‘sing’ even where speech was not possible. Music is a quickener, an enabler. This was a delight to see. Thank you.